Hollow letters, four feet tall and one foot deep, with lighting on the inside and five types of metals cladding their exterior are cantilevered over the river on a thin beam. They turn 90 degrees periodically. 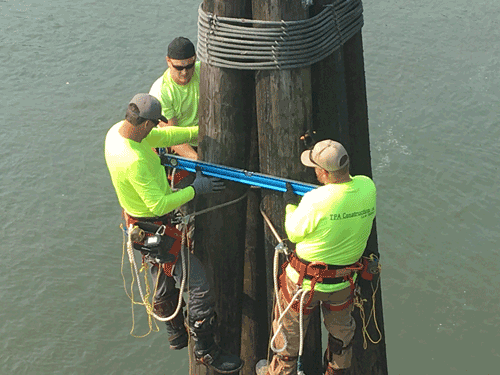 250 steel bands cover the many old pilings surrounding the pier to show the always changing height of the river. Mill Street pier, West Sacramento, CA, on the Sacramento River. The City of West Sacramento is often misunderstood to be part of the City of Sacramento. 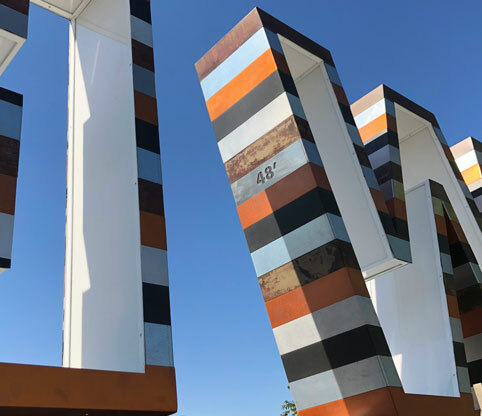 This artwork makes West Sacramento the center and the subject. It turns WEST toward West Sacramento while showing its back across the river. However, in a welcoming gesture, it then periodically turns 90 degrees and shows its name forwards to downtown Sacramento. The work is about orientation in a second way. 250 glittering numbered steel bands on the pilings surrounding the pier orient the viewer to the ebb and flow of the river: daily, yearly, and in relation to drought vs. rainfall. They are numbered with the river height and are parallel to the river's surface through the magic of compound curves. fabrication and installation: Thomas Swan Sign Company, Inc.